Children go up to the mountain located opposite Brua village. There they will divide into boys and girls, and respectively make a big bonfire. 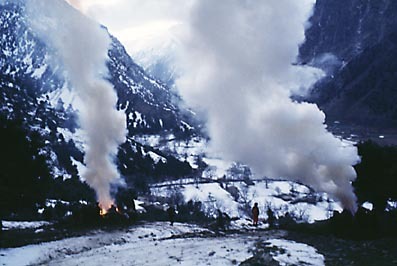 After singing songs for some time the fire will be extinguished and then the two groups will compete with each other for the size of the smoke that rises up in the air. Then they all go down the mountain and return to the village singing " songs of Sarazari" carrying branches cut down from the mountain top. The elders will be waiting chanting songs in the village.